Day four took us to 13 new wineries. It’s a good thing we were splitting our tastings otherwise we would end up like Sarah, a local we encountered at the last stop of the day. We started out traveling down yet another dirt road and arrived at the charming Notaviva Vineyards where they pair their wines with different music. Stop number two is the sprawling Breaux Vineyards estates. The wines there were refined and full of complexity. 868 Estate Vineyards was next. Here they were offering their tastings both inside and on their gorgeous patio. They also have a restaurant on property that was offering paella. Although we passed on the food, it did smell delicious. Hillsborough Vineyards was our next stop. Here we found a rosé of Petit Manseng and Tannat that was the most complex rosé that we’ve encountered in a long time. We also enjoyed a nice chicken salad sandwich from their kitchen on their patio (which had an amazing view). The next winery on our list was Northgate Vineyard. They off the grid and powered completely by their own solar panels. Their 2011 Meritage was actually selected as one of the 12 wines for the Govonors Case. Doukenie is the next stop. They are known for their full bodied reds and very picturesque barnyard setting. A quick drive down the road and we found ourselves at Crushed Cellars. This is a much smaller winery offering a limited number of very tasty wines. We also picked up a loaf of fresh baked bread to eat on our drive to the next stop. Sunset Hills Vineyards is next on the list. They are set in an Amish style barn with high ceilings and a good selection of wines. 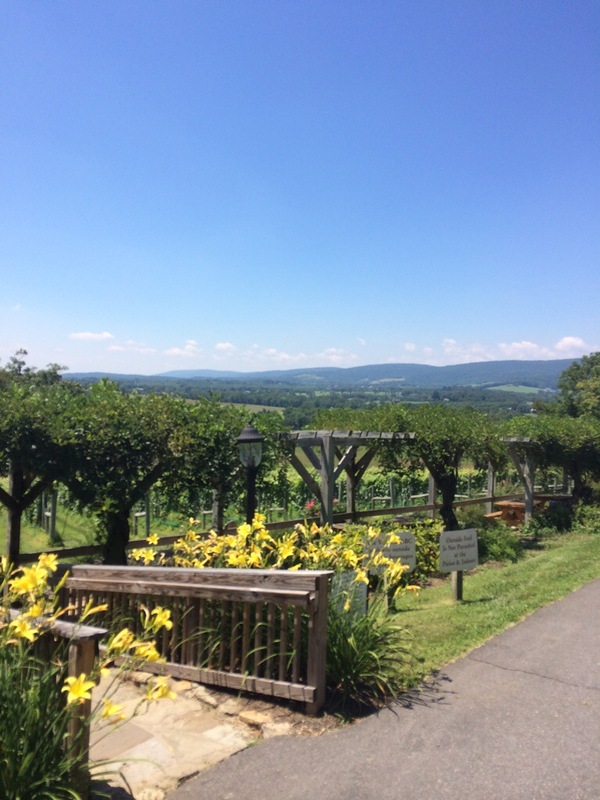 While we were in Loudin county, we thought it would be a good idea to visit Loudoun Valley Vineyards. The wines were alright but the tasting room was far too hot. After a quick tasting there, we decided to move on to 8 Chains North. This cozy winery offered an excellent white blend of Traminette and Vidal Blanc. We moved on to an Irish themed winery called Hunters Run Wine Barn. They were having live music on their patio, so most people were outside and we could enjoy the tasting room in relative peace. Otium Cellars was going to be the final stop for the day. They specialize in German and Austrian grapes which were a refreshing change from the standard fare. Our final stop was along the route back so we decided to peek in atVeramar Vineyards. The wines were very classic and quite enjoyable. I think the company we were with made the place even more fun. As I mentioned earlier, we met Sarah. She had a bit of wine and was really enjoying the fact that we were taking notes about everything. There were several wineries today that we would definitely return to. Sunset Hills was pretty, Northgate was unique and Eco-friendly. 8 Chains North was relaxing and provided a comfortable atmosphere. Hillsborough had an amazing setting.